Unfortunately, most of us have had to endure a friend or family member who was a complete nightmare to be around while she was planning her wedding. This is more than likely due to her not realizing how tedious it can be to get the job done. Well, that doesn’t have to be your reality. The anger, anxiety and stress that come out of a bride who is normally pleasant to be around can usually be avoided if the right approach is taken. So, today I want to give you some real, practical advice for you to consider so you won’t be labeled a BRIDEZILLA. If you haven’t noticed by now, a budget is pretty much the preliminary step in any planning activity you will be doing, wedding or otherwise. You not only must know how much money you have to spend, but you also need a plan for each one of those dollars. If you don’t have a proper budget in place, you are setting yourself up for stress and anxiety. 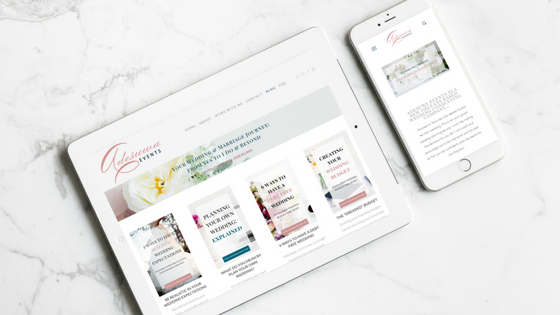 Click here for advice on how to get started plus a free wedding budget checklist. Most brides underestimate how important it is to have a specific plan in place on how to tackle ALL THE THINGS when planning a wedding. Disorganization can throw a wrench into your process and cause you to be anxious, inpatient, and in some cases, just unpleasant to be around. So, it’s extremely important that when you decide to take on this task, you also decide to be intentionally ORGANIZED. Now, if you aren’t naturally a detailed oriented person, it will be especially crucial that you have a system in place to keep you accountable and organized. You will need a filing system, physical or electronic, for all your contracts, receipts, to-do lists, checklists, timelines, design ideas, color palettes, etc. You won’t be able to keep it all sorted in your head. And you will literally drive yourself mad if you try. Getting organized early on can really alleviate the drama that sometimes goes along with wedding planning, so do whatever you need to do to streamline the chaos, so you can get through this phase of life unscathed. Communication is key in any situation, but especially while planning a wedding. Now this is probably the one thing that most brides labeled “BRIDEZILLA” are notoriously horrible at; almost to the point of being unreasonable. But something you should keep in mind; because you will be relying on so many people, it is imperative that you give clear instructions so that they all know what you expect of them. So, I mentioned that you should not just communicate, but that you should overcommunicate. And this is the reason why. Emotions run high while wedding planning and sometimes things are forgotten or misunderstood. So, to avoid unnecessary confusion, say it once, say it again, and write a note, if necessary, to be sure everyone is on the same page. Earlier I stated that a lack of quality communication can cause you to be unreasonable. I want to elaborate on this for a minute. When your communication style in unclear, you tend to make demands and requests that are just not logical. For instance, let’s say you have decided that you want to give welcome gifts to your out-of-town guests as they arrive and check into their hotels. You order the gifts and check that off on your checklist as DONE. But what you don’t do is plan on who will put the gifts together, or who will deliver them to the hotels for distribution to your guests. It’s now the week of your wedding and you are expecting your bridesmaids to put together welcome gifts and play delivery driver. This would be an unreasonable request because you didn’t inform your bridesmaids that this would be on their to-do lists. As I said, emotions will be high, yours and everyone else around you, so try to limit unnecessary confusion by simply communicating. Gratitude is so important during wedding planning. Your friends and family have stepped up to be a part of your journey in one capacity or another. They, in most cases, have spent money, taken off from work and spent time away from their own families to be there for you. And it is your RESPONSIBILITY to be grateful and show them some well-deserved appreciation. You should also keep in mind, that your vendors have worked extremely hard and have accommodated you and your requests as well. So, they also deserve your gratitude. Now when I say show appreciation, that doesn’t mean spending ridiculous amounts of money. It merely means showing genuine signs of gratitude; that could simply be a hand written, heart-felt thank you note that expresses how you appreciate their contribution to your special day and the role they played in your journey. None of these suggestions are rocket science, but when done together, you will be on a less stressful, more enjoyable path as you walk through your wedding planning journey. You will be happier and those closest to you will be happier because you will less likely be a nightmare be around.